The mission is simple: performance in severe conditions. 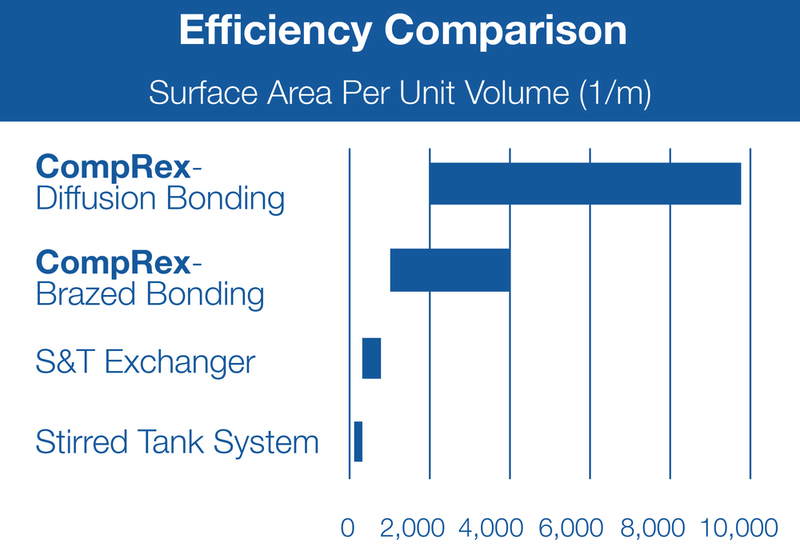 The CompRex Compact Heat Exchangers and Compact Heat Exchange Reactors are custom designed for a wide range of chemical process applications where efficient heat transfer is critical. The CompRex unit is designed with alternating layers of streams of process and utility, each layer constructed of multi-channels with hydraulic diameters in the mm range.This design results in a high surface area-to-volume ratio with heat transfer superior to most conventional reactors and heat exchangers (see figure on left).At the same time, stream volumes are larger and more flexible than micro-reactors, especially for reactors with solid packed catalysts. The alternating layers with multi-channel design allows for simple scale up of the exchanger and reactor system. By increasing the number of channels per layer and/or increasing the number of alternating layers, reactor scalability is easily achieved while preserving near-identical hydrodynamic and heat transfer of the smaller reactor.Furthermore, with current industrial trends of process intensification, the CompRex reactor can also be scaled through skid mounted reactors and delivered as part of separate modules. With its design flexibility, the CompRex unit can be engineered to offer the desired performance of many processes that are currently heat transfer limited.The choice of materials and manufacturing methods are also critical to ensure unit integrity, especially for very extreme operating conditions, such as high temperatures and high pressures.With the layered reactor design, intermittent injection into the reactor can also be achieved.Therefore, injection of reactants, fluid catalysts or other chemical additives can be accomplished to further enhance reactor performance and product yield controllability. CompRex is specializing in the design and manufacturing compact heat exchangers and heat exchange reactors engineered for high temperature and pressure applications.